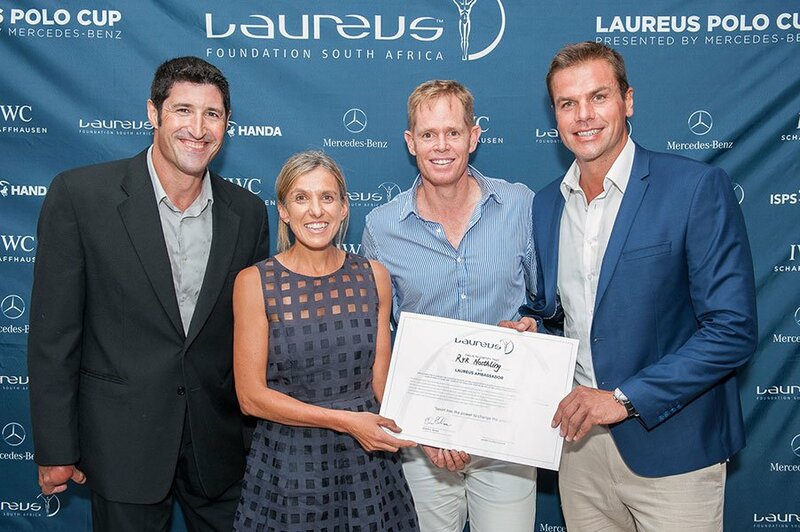 Laureus SA Ambassadors, from left: Ernst van Dyk, Elana Meyer, Shaun Pollock, Ryk-Neethling. Former South African swimmer and Olympic gold medalist, Ryk Neethling has been named the latest Laureus Sport for Good Foundation Ambassador joining an impressive list of sports icons who are a part the Laureus Family. The announcement was made at the inaugural Laureus Polo Cup hosted at Val de Vie Estate over the weekend. Born in Bloemfontein, Ryk attended Grey College, where he excelled in swimming, earning a place in the South African swimming team for the 1996 Summer Olympics in Atlanta; he has since been lauded as one of the most accomplished swimmers to come out of the South African ranks. He currently holds the South African record in the 200, 400, 800 and 1500 metres freestyle events and up until August 2006 held the 4×100 metres freestyle relay world record. Chairman of the Laureus Sport for Good Foundation SA, Morné du Plessis, said: “We are really excited to welcome Ryk to the Laureus stable. Ryk has proved himself to be more than just a triumphant sportsman. He has been an inspiration to swimmers across the country, understanding the importance of nurturing talented sportsmen and essentially playing a vital role as a mentor to champion swimmers Chad le Clos and Cameron van den Berg. Ryk epitomises the Laureus philosophy, we are really excited to have him on board.” says Morné du Plessis, Chairman of the Laureus Sport for Good Foundation. “It’s a massive honor for me to be named a Laureus ambassador – on par with the privilege of being an Olympian. Not every Olympic gold medalist is invited to become part of this elite organisation. It shows that you’ve achieved more than just a win but have done something significant with it, and it is my goal to use my influence for good.” explains Ryk Neethling. Ryk joins a remarkable list of current and former sportsmen and women around the world who support and promote the Laureus Sport for Good Foundation. Ambassadors volunteer their time to work for the Foundation whose mission is to use sport as a means to combat some of the world’s toughest social challenges facing young people today, such as juvenile crime, gangs, HIV/AIDS, discrimination, social exclusion, lack of education, landmine awareness and health problems such as obesity. Since its inception Laureus has raised over €85 million to improve the lives of millions of young people and has supported more than 150 community sports projects in 35 countries.